Patience is a Virtue. And also Essential for Daytime Naps. Oh! I have realised that (in my own experience at least) achieving daytime naps is as simple as having the patience of a saint. I mean, literally. The patience of a saint. Today? Forty-five minutes of wailing, which I ignored because I was trying to fix a problem with a plugin (the website kind, not air-freshener), and lo and behold: she sleeps. Though I now need to do a massive cough and I’m sat on the bed next to her hemmed in by laptop and charger wires and all sorts, so I’ll probably wake her up again within the next thirty seconds. Ah yes! There we go. Right, where were we? Patience of a saint. Or, if you look at it another way, you just need to be able to detach and ignore. Play white noise REALLY LOUDLY and simply tune out the crying. Because (now that I can tell the real crying from the “I don’t fancy having a sleep right now” crying) both go hand in hand, really; either you’re properly patient and can do the whole sitting-next-to-the-cot-stroking-their-face-as-they-wail thing, or you’re just semi-patient (like me) and you catch up on emails and browse ASOS whilst making half-arsed soothing noises. I tend to do a mix of both, depending on the patience levels I have left that day. 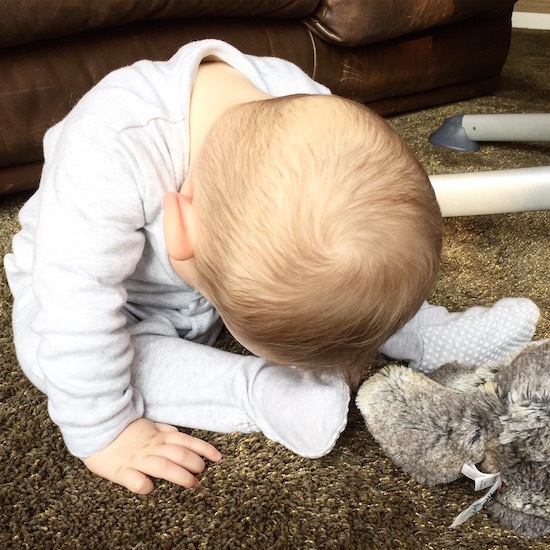 Read the 9 Month Baby and Body Update…. Now that the baby is generally pretty good at night (more on that in an upcoming post, because I know some have asked for the magical trickery I used – alas there is none, I think it’s a mixture of luck and baby development) it’s the daytime naps we are working on. One in the pram in the afternoon, one in the morning in the living room in front of this Youtube video. It shows fish (the Finding Nemo type) gently swimming about in the ocean whilst Amazing Grace plays over and over again. Sometimes it takes up to an hour to get the baby to succumb to the ways of the fish, but we always (nearly always) get there in the end. I’ve found that if I close the blinds and sit down and type next to her chair (as I’m doing right now) the extra clacking sound sends her off too.